We are excited to invite you to our MFW Café, a place where experts, non-experts and media students can come together to start a dialogue. In a laidback setting -like your favorite cafe- it’s easy to start a conversation and share knowledge, opinions and collect insights. 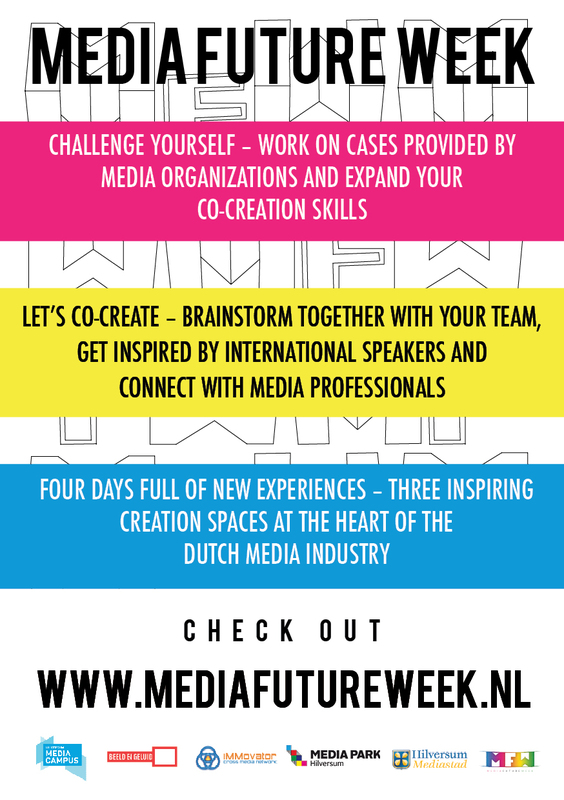 Students participating in the Media Future Week will prepare questions or ideas worth sharing that will help them make the next step in their concept development. The MFW Cafe will be open Wednesday 17th of May 10:00 at Hilversum Media Park. We’ll kick off at 10:30 and close the cafe at 12:00. MFW Café is a special program part of the Media Future Week 2017. We are looking for 40 people with an open mind, who like to think fast forward, enjoy a dialogue and have some relation to media or post-truth: you don’t have to be an expert on the subject. Do you like to share your knowledge and experiences in a fun and effective way? Would you like to meet 40 fellow fast forward thinkers? Please join us and fill in the form. RSVP will be required for entry. A lunch will be served for those who’d like to stick around and ride along with the Media Future Week waves. For further questions feel free to contact Willemijn Phielix via +31648783565 or willemijnphielix@icloud.com. We are excited to welcome you at the MFW Cafe!